Thinking about trying a church? You’re not alone. Plenty of people who haven’t been connected to any church, at least since childhood, are finding something missing from their lives these days.We live in a stressful, materialistic world. Our families are exposed to questionable values. How can we fill that “God-shaped hole” within us? Whoever you are, wherever you are on your journey of faith, you are welcome at Holy Cross. 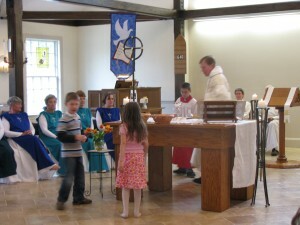 Children of the congregation bring the gifts of bread and wine to the Altar. What is Holy Cross like? The best way of answering this might be that it’s kind of an “in the middle” church. It’s Catholic in that it has Mass (we usually call it the Eucharist), sacraments, vestments and something of a traditional feel. It’s Protestant in that we have great respect for people’s ability to decide questions for themselves and to be in different places and explore faith on their own. It’s contemporary in that we mix in different music styles and our worship has a warm, relaxed feel. Who attends Holy Cross ? The sense of family is what strikes people most about Holy Cross. We have all ages, but in particular a lot of younger families and children. A few members now in their sixties have attended Holy Cross since they were children. Many more have joined recently when they moved to the area. There are single parents, families where only the mom or the dad attends, divorced people, retired people, unemployed people, people who work at a wide variety of jobs. Some people dress up and some do not. Holy Cross is very much a cross-section of our community. We like it that way! 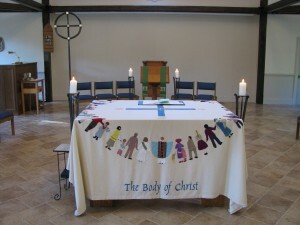 The Altar at Holy Cross. How will I know if Holy Cross is for me? The best way to “try” a church, however, is to come a few Sundays and experience worship for yourself. If you have more questions after that, either the vicar or any member of the congregation will be glad to talk with you. One thing you won’t find at Holy Cross is a lot of pressure to “join.” It’s just not our way. We’re glad to have you as a member, or as a guest…whether you decide to return or not.